Happy Summer Saturday! I hope you are enjoying each moment as the days of summer seem to be quickly zooming by. I know all too soon I will be heading back to Florida and my days here in our country cottage will be at an end! I plan to grasp each day and make the most them. 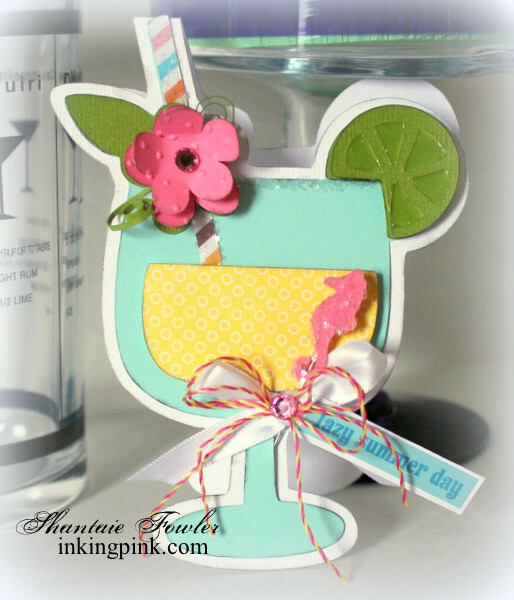 I made this card last summer for Cricut, and its still one of my favorites...it reminds me to slow down and sip in some sunshine! This summer will be particularly memorable, so far it has been filled with many visits with friends and family, lots and lots of work, a slow and agonizing restructure process to our family business, and saying goodbye to my Cricut Circle team mates. Change is always a bit hard, but a few icy drinks with sugar rims and paper umbrellas, while sitting on the deck .....well that makes all the difference in the world! Hi I'm Shantaie the face and the glitter & grit behind Inkingpink. I'm a creative rulebreaker, and encourage you to be one too! I celebrate almost every holiday, occasion, and "just because"with gifts. I run purely on caffeine, sparkling beverages & laughter. Oh and chocolate too. If you like to craft, create, or glue stuff together, this may be the place for you! I invite you to be inspired, learn, share, and make Inkingpink a place where you can feel at home. Want to see what I'm up to? 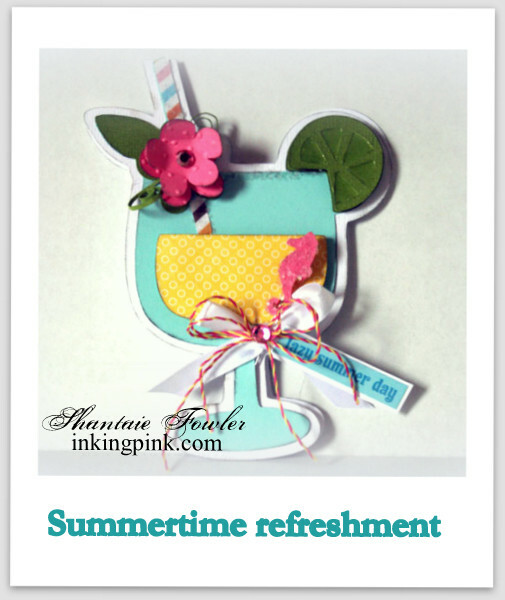 Follow Shantaie Caudill-Fowler's board Parties on Pinterest. Where Can I find it? Hot Dog and paper french fries! I've designed forThese great companies! My Craft room was featured! This blog is for personal inspiration only and all projects are my original designs unless otherwise stated. No comercial use, or copied material used for contest entries or publications are permitted without my written expression. Im a Cricut Circle designer and Provocraft and many other generous companies have provided me with products and materials to work with. However I do not endorse any product that I do not believe in or use myself.